Yep I’m reviewing yet another superhero comic. What can I say? I like superhero comics, especially ones that don’t seem to fall into the traditional all powerful creature from another planet. And this one feels…different, at least upon reading the description. 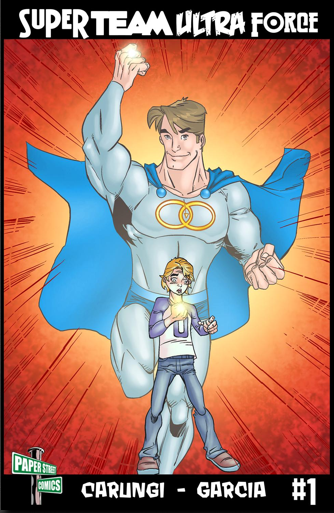 Or at least feels/looks a bit like Captain Marvel with a young boy acquiring a ring of power that will apparently give him super powers. I say apparently because this issue only just sets up the world and allows us to meet the characters, but doesn’t let us see the superpowers yet. But what is here is a nice start to a series. Zander is dreaming. Dreaming of being a hero, a grown up hero, and saving the city from a giant robot attempting to destroy the city. And then he wakes up at the kitchen table, just in time to see the school bus start to pull away. Luckily for Zander the star QB is his neighbor and stops it for him. Zander makes it to school and begins his navigation of the halls. As a kid that skipped a grade he has to be on the lookout for bullies, teachers, and *gulp* girls. While hiding from the local bully in the janitor’s workroom he finds a strange looking ring, but before he can ask the janitor any questions a robot scares him away. Later that day the ring begins to glow and sets his microwave on fire! Zander, eager to find out what’s going on with the ring, tracks down the janitor and…told he’s the one. The ring is meant for him. But he can’t explain anything and tosses Zander in the open furnace along with two companions, the robot and a talking lizard. The furnace you see is a gateway to another world…where dragons await. How will Zander ever survive? Mighty Max. Those were the first two words that jumped into my head after reading this issue. The main character, Zander, really reminds me of Max from that classic mid 1990’s cartoon. Just the way that he reacts to the world around him and the sense of being and acting like a real kid. Which I really like. He’s a typical young kid who is a bit over his head, but is trying to swim anyway. It’s important for me when I read a comic where the main character is a kid that they act like a kid. For example, when Zander is just starting to figure out what the ring is and does he accidentally sets the microwave on fire. It’s just something that I can see myself doing. What I really like about the story is that we’re given a chance to meet the characters and the type of world that they live in. Its building slowly, perhaps a bit too slowly as the ending was a bit rushed, but they do a better job of giving us memorable characters than many comics do. They put the focus upon character development, which is nice and they don’t necessarily have the traditional roles assigned for them. For example, the normal bully of the series would be a star athlete, but here the star QB actually kinda respects Zander–even though he’s using him to get his homework done. He’s not mean to him and seems to actually care for him. I look forward to seeing what happens to Zander and his new friends in the next issue. The first thing I notice about the artwork is the front cover. 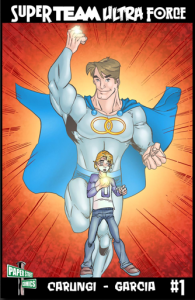 It’s a powerful image of a young boy with a semi glowing hero standing behind him….and what I keep getting drawn to is the fact that the hero looks like he has really out of control hairy armpits. It’s weird I know, but that’s what I see. It’s just weird positioning of the shadows though. Other than that thought I really like artwork in the issue. The characters are well designed, they have great facial expressions and you can really see the fear, confusion, or happiness in their faces. The backgrounds are well drawn as well, with just enough detail to keep you interested without being overwhelming to what’s going on. The colors in the issue are bright, vibrant, and completely appropriate for what’s being depicted. It’s difficult to tell what the story will be like because there just isn’t enough of it there yet, but they have set up the world and created interesting characters. And I look forward to seeing what happens next to them. I’d give this to any kid that’s always wanted to be a superhero…which is probably most of them.